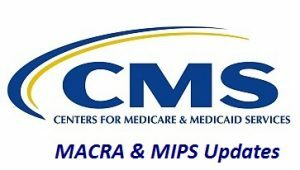 The Centers for Medicare & Medicaid Services (CMS) invites the public to comment on the Medicare Access and CHIP Reauthorization Act of 2015 (MACRA) proposed the rule. Comments are due by 5:00 p.m. ET (for mail or courier submissions) and 11:59 p.m. ET(for electronic submissions) on Monday, June 27, 2016. Ends the Sustainable Growth Rate (SGR) formula for determining Medicare payments for health care providers’ services. Creates a new framework for rewarding health care providers for giving better care not just more care. Combines our existing quality reporting programs into one new system. These proposed changes replace a patchwork system of Medicare reporting programs with a flexible system that allows participants to choose from two paths that link quality to payments: the Merit-Based Incentive Payment System (MIPS) and Advanced Alternative Payment Models (APMs). For more information on MACRA, visit the Quality Payment Program webpage and subscribe to receive Quality Payment Program listerv messages.